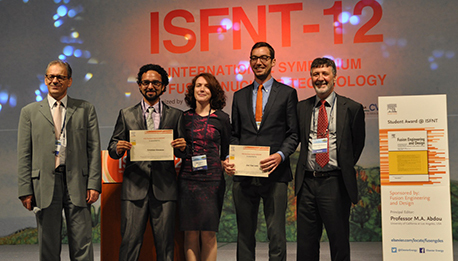 Jon Van Lew (second from right), a UCLA graduate student, split top prize of the inaugural FED Student Award @ISFNT. His presentation was titled Numerical Study on Influences of Bed Resettling, Breeding Zone Orientation, and Purge Gas on Temperatures in Solid Breeders. Top honors of the award and prize money were shared between Jon Van Lew and Cristian Gleason-Gonzalez, a researcher from the Karlsruhe Institute of Technology. Jon Van Lew works in the UCLA Fusion Science and Technology Center with Professor Mohamed Abdou and Dr. Alice Ying as part of the ‘ceramic breeder’ team. In the group, they have been focusing on creating numerical tools to help analyze and optimize designs of ceramic pebble beds for breeding tritium in fusion reactors. Their recent efforts have specifically concerned the development of new numerical models that can describe ceramic pebble beds as their thermomechanics evolve from the many effects of repeated thermal cycles. More information on the lab and recent publications can be found on the UCLA fusion website, http://www.fusion.ucla.edu/.